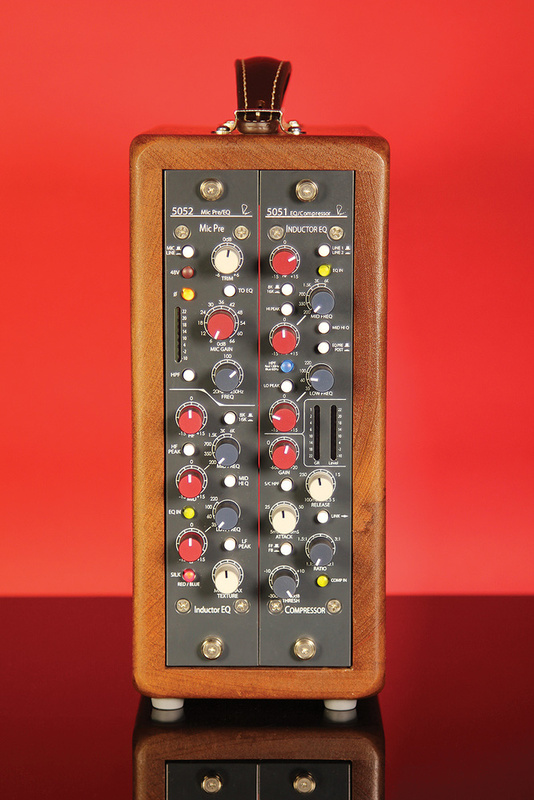 These classy modules bring the best of Mr Neve’s classic designs into the 21st century. I’ve never borrowed a penny from Rupert Neve, but I owe him a great deal! A long time ago, I sat down behind a Neve console in the basement control room of a tiny, long–forgotten studio in an Edinburgh back street. That console was a 1970s,16:4 8014 Small Studio Console, loaded with 1073 mic pre/EQ input modules. I learned how to listen and how to engineer on that 8014 and, to this day, its sound remains etched on my aural memory. Two decades had to pass before I found myself in another long–gone studio, sitting in front of a 1970s Neve, this time around a fully rebuilt 32:16 8048 loaded with 24 1064 and eight 1073 modules. Over 40 years after those two consoles were built, the sound that Rupert Neve pioneered and developed in his old rectory in Little Shelford still entrances recording engineers and producers. 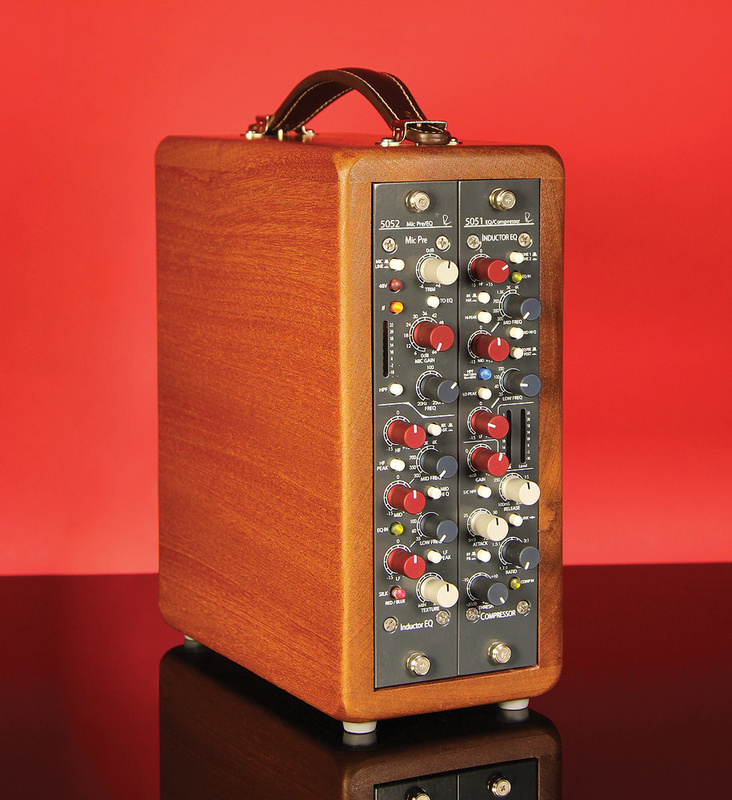 Although original 1073 modules are now relatively rare and savagely expensive, you’ll find ‘1073’ modules waiting for you, ranging from painstaking recreations by AMS–Neve and a handful of ‘boutique’ manufacturers, all the way down to DIY homebrew designs. It seems to me that Rupert Neve has never been one content to stand still and rest on his laurels. Having sold the company that still bears his name, he founded ARN Consultants in 1975. The end of his involvement in the ill–fated, original incarnation of Focusrite in 1989 was followed by a period of consultancy with Amek that culminated in the launch in 1993 of their System 9098 console. In 1994 Rupert and his wife Evelyn moved to Wimberley, Texas, where, in 2005, ARN began trading as Rupert Neve Designs (RND) and launched the first of the Portico product line. Over the last 10 years, the engineering team at RND have released a steady stream of new products, all of which are based on the sonic principles of his classic design, but have been built for a world dominated by DAW software — so although you can clearly see their heritage, none of those products have been clones or copies of their ancestors. With the launch of the Shelford Series 5051 EQ/Compressor and the 5052 Mic Pre/EQ, RND engineers have now cast their eyes back to the old rectory and have combined vintage design elements (from both the 1064 and the 1073) with concepts and components from the Portico series, to create a contemporary take on a vintage channel strip. The Shelfords are handsome units, their thick steel front panels finished in the classic blue found on early Neve consoles. The rotary knobs are anodised metal, their colour following their function: red for control, black for selection, silver for anything else. Illuminated LED buttons indicate key active functions, and smaller white buttons handle any switching. Although both the 5051 and 5052 can be fitted into the penthouse of an RND 5088 discrete analogue mixing console, they both require a ±24V external power supply and custom–sized racks for stand-alone use. RND supply two-, four- and nine–module racks, and five- and 25–way power blocks to satisfy those requirements. Both the 5051 and 5052 feature Class–A, discrete–component, ±24V circuit topologies. 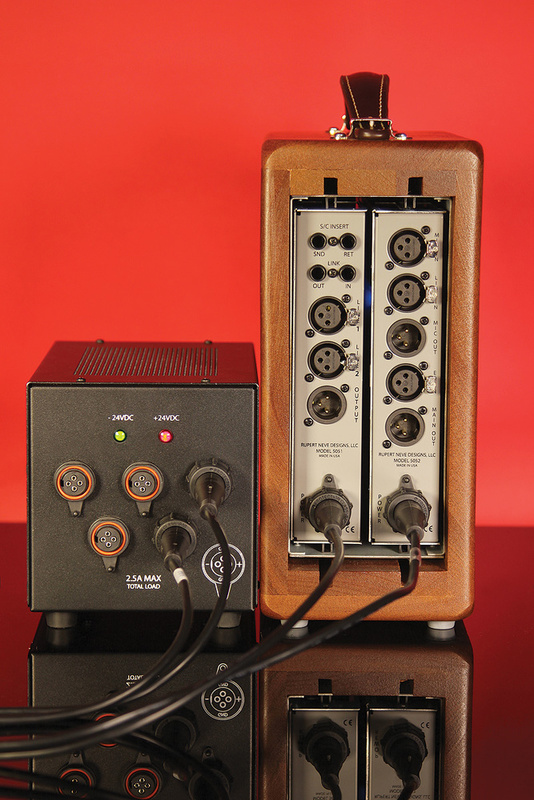 Traditional transformer–coupled inputs and outputs are used in both, for technical as well as musical reasons. Their signal paths employ Class–A gain blocks, and use as few of them as possible to get the job done. This minimalist approach, coupled with custom–wound inductors and transformers, is designed to give both units the performance, sound and musicality for which the 1064 and, in particular, the 1073 are known. Both the 5051 and the 5052 are equipped with a three–band inductor–based EQ in which the use of Class–A, low feedback, discrete–component electronics plays an important role in preventing the sound being undesirably affected by low–level artifacts and harshness. History repeats itself with the use of a custom–tapped inductor and carefully selected capacitors in the mid–range. Inductors are also used in the high– and low–shelf EQ, where the shelf curves are based on those of these two vintage designs. In some senses, this is a bit of a ‘greatest hits’ EQ, with the low–frequency band being based on that of the 1064, the 1073 supplying the mid-range’s inspiration, and the high–frequency circuitry being a hybrid of the 1073’s inductor and modern capacitor componentry. 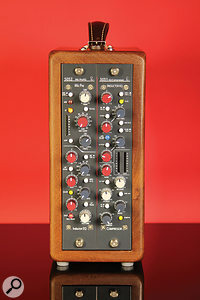 However, the EQ circuitry is no slavish copy of its antecedents: it’s much more an update of the original designs, using components and design techniques that simply didn’t exist when the 1064 and 1073 were being developed. The redesign has given RND’s engineering team the opportunity to add flexibility to the original implementations. The 5051 and 5052 both inherit many features directly from vintage Neve console modules, but also from the more modern RND Portico series. In the case of the LF band, which acts at the vintage frequencies of 35Hz, 60Hz, 100Hz and 220Hz, the addition of a peak filter to the original shelf filter makes available a bell–curve option, to give a total of eight different LF EQ response curves, adding a finer level of control to the 1064’s signature bass sound. The mid range remains true to the 1073’s tonal heritage, but the frequency selection has been changed from the original five points (360 and 700 Hz, and 1.6, 3.2 and 7.2 kHz) to a six–point model (200, 350 and 700 Hz, and 1.5, 3 and 6 kHz). This produces a slight overlap at 200/220 Hz (often a problem area) and makes space available, if necessary, for the new mid-range 6kHz position to operate in conjunction with the new 8kHz HF setting. The Q of this 1073–based mid–range EQ narrows as cut or boost increases and, conversely, widens as cut or boost decreases. Overall, the Q tends to be slightly wider at lower frequencies and slightly narrower at higher frequencies. In a deliberate design decision, the Q is also narrower for cuts than it is for boosts. This makes a lot of sense to me since, when particular frequencies are being cut, they are usually the ones causing problems. When engaged, the Mid Hi Q switch, which wasn’t present on the original 1073, narrows the Q considerably, giving the 5051 and 5052 a finer frequency focus than was available on the 1073. For the high frequencies, not only has a bell–curve peak filter been added alongside the original shelving response, but also the 1073’s original fixed corner frequency of 12kHz has been replaced by a switchable choice between 8kHz and 16kHz to give a total of four different HF EQ response curves. The one difference between the 5051’s EQ and that of the 5052 is in the placement of the high–pass filter. In the 5051, the HPF is an 18dB/octave Butterworth filter, set at either 60 or 120 Hz, which sits inside the EQ between the mid-range and the HF and LF shelving circuits. This positioning is dictated by the fact that the EQ section in the 5051 can be switched pre– or post–compressor. In the 5052, it’s a 12dB/octave high–pass filter, and it’s continuously variable between 20 and 250 Hz. This sits in the audio path immediately after the input gain and trim controls, a circuit position which is necessary because both the mic preamp and EQ have their own separate balanced XLR inputs and outputs — an HPF that was part of the EQ circuit would not be active unless the mic preamp was being routed through the EQ. 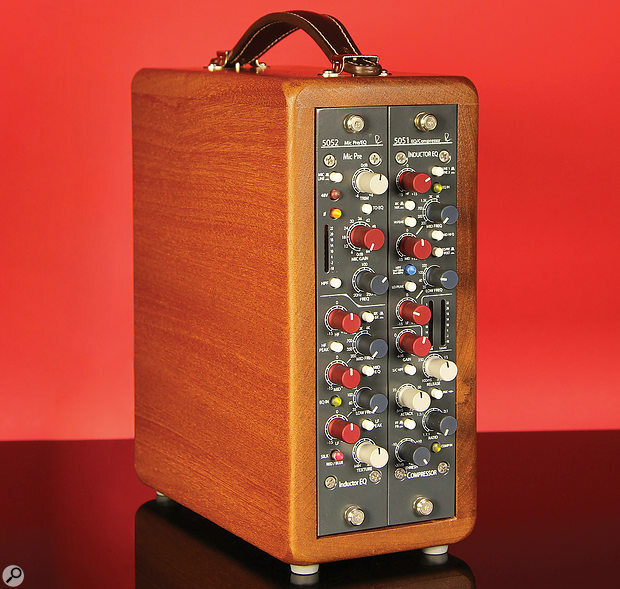 Readers with an interest in RND’s Portico product line may well think that the Shelford 5051 looks familiar, and they wouldn’t be wrong. The Shelford 5051 is essentially the Portico 5051 EQ/Compressor module (first launched in late 2011 for use exclusively in the 5088 console), repackaged and relaunched for stand-alone use. The 5051’s VCA compressor, like the EQ section, harks back to the past not only with Class–A gain blocks, but also mixes in gain–reduction techniques that have been developed over the years. From the modern age come elements from the highly regarded Portico II Master Buss Processor. The compressor’s threshold ranges from –30 to +20 dBu, its ratio can be set from 1.1:1 to 40:1, attack time can be continuously varied between 5 and 75 ms whilst the release time can be set anywhere from 100ms to 2.5s. Make-up gain can be set from –6 to +20 dB. This is a far cry from the vintage Neve 2254 compressor/limiter, with its fixed 5ms attack time, five fixed compression ratios (1.5:1, 2:1, 3:1, 4:1, 6:1) and its four release times (400ms, 800ms, 1.5s and an Auto range of 50ms to 5s). 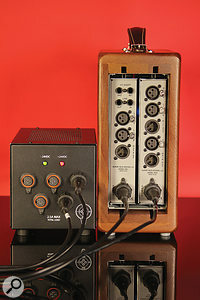 PSUs are available that can deliver power to five or 25 modules, while the channel strips themselves feature multiple outputs, including a link facility and side-chain insert for the 5051.The 5051 retains the classic feedback mode, in which a signal taken after the gain–reduction stage is used to trigger compression, giving a smoother, gentler, more traditional–sounding compression. However it also gains the more modern, feed–forward mode, in which the gain stage’s input signal is used to trigger compression. Feed–forward topology typically allows high ratios and tends to be faster, so it can have a more dramatic effect on the audio signal. Used in moderation, though, it can offer a more flexible and cleaner sound. The 5051 includes another 12dB/octave high–pass filter (250Hz) in its side–chain, to reduce the possibility of low–frequency material inadvertently affecting gain reduction. A rear–panel link switch and associated quarter–inch jacks allow multiple 5051s to be chained together for stereo or multi-channel operation. Also at the rear, a side–chain insert loop allows you to plug in your own EQ for de–essing and so on. The 5051’s rear panel also carries the two balanced XLR line inputs (only one of which can be active at any one time) and the compressor’s single balanced XLR output. These allow you, for example, to connect the output of the 5051 on one and a channel from your DAW to the other, without any need for repatching. Worthy and wonderful though the improvements to the classic vintage designs in the EQ and compressor sections may be, it’s what they’ve done with the 1073 preamp in the 5052 mic preamp that interested me the most. First up, 48V phantom power is now selectable via a front–panel control. More importantly, there’s 72dB of discrete component, Class–A gain on the mic input — 66dB in 11 6dB steps and ±6dB on a trim control. The old rear–panel Hi/Lo impedance switch has disappeared and a line–level balanced XLR input has appeared. The chunky, square–cored input transformer sits post the mic/line selector and Phase (polarity) switches, and pre the trim control. The high–pass filter turns up next, after which the signal takes two parallel paths. One runs straight out through an output balancing transformer to the Mic Out XLR, giving a completely clean direct out for recording or for feeding an external processor such as the 5051. The other path is only activated when the To EQ switch is engaged, routing the parallel signal through the EQ section and out, via another transformer–balanced XLR, to the 5052’s main output. This output–transformer stage features the Silk Red/Blue and Texture facilities from RND’s Portico II series, which allow you to mould the harmonic content and tonality of the output stage. With these controls active and sufficient drive on the output, the 5052 can deliver four to five percent THD, which is mostly second–order distortion and adds richness and body to tracks without overloading the output stage. When the mic signal is not being routed to the EQ, the rear–panel balanced XLR EQ input is active. This enables you to run an external signal, such as a DAW return, into it to take advantage of the 5052’s EQ and Silk features. In addition to the recordings I made, I still own the same old Guild guitar and a few of the same AKG microphones that I used with both vintage Neve 80-series consoles all those years ago. Listening to that guitar through the Shelford 5052 was an interesting experience. The basic character of those old Neves was still evident: the clarity in the high end, the warmth, the scale, the sheer ‘size’ of the sound was there, although I felt a definite sense of increased overall detail. Being able to trim the preamp gain with 1dB precision was an added luxury — although I don’t remember ever being phased by the 5dB steps in the old modules! As it was back in the day, in a mix situation the basic sound of the guitar recorded flat needed cutting back a bit to leave room in the spectrum for other instruments, and judicious use of the HPF and EQ did a perfect job of sitting the guitar into an appropriate spectral space. With the 5052 EQ in circuit, I had the chance to experiment with the Silk and Texture controls. The Silk function reduces the negative feedback on the output transformer, adding harmonic content to the output signal as Texture increases and negative feedback decreases. With the Silk switch shining red, the saturation in the mid and high frequencies is accentuated, whilst in its blue state, the lower frequencies’ saturation is increased. The amount of saturation depends on how hard the output transformer is being driven. Juggling Silk colour, the Texture control and the drive into the output transformer gave me results ranging from great to fabulous. Silk is a very addictive addition and I could get very used to over–using it on any source. I’ve not had the opportunity to work with a vintage Neve compressor, so I have no idea how the 5051’s compressor would measure up against one, but I can say that the 5051 contains a very fine compressor. This was the first time that I have had the opportunity to compare feedback and feedforward compression back to back on a single outboard processor, and to really get to grips with the different responses. The Rupert Neve Designs 5051 and 5052 are two of the most artistically inspiring pieces of audio gear that I’ve heard in many a year. The nature of the sound that they produce takes me right back to my early experience on 1970s Neve consoles but adds a little something that I don’t remember from back then. Everything that contributes to the classic sound of a Neve console is in there — transformers, Class–A circuitry, inductors — and, to my ears, a modern layer of detail has been added that illuminates proceedings. Although the 5051 and 5052 take their inspiration from vintage designs, they aren’t clones in any way, shape or form. Perhaps I’m being fanciful, but I have the feeling that the 5052 sounds the way that the Neve 1073 was always capable of sounding, or perhaps it’s just that Rupert Neve and his engineering team have reached a design pinnacle after all these years of research and effort. Either way it doesn’t matter, the Shelford Series 5052 is simply a superb microphone preamp and EQ combination. I have a slight worry that the Shelford Series 5051 might be in danger of being overshadowed by its stablemate. That would be a real pity, as the 5051 has an enormous amount to offer artistically, both in tracking and in mixdown. Pairing it with the 5052 produces a complete and flexible modern vintage channel strip that is ideal for the DAW environment and that offers good value, despite being priced towards the top end of the market. Audition these at your credit card’s peril, but you really should take a listen! If you’re a Neve aficionado, then doubtless only the AMS Neve recreation of the 1073 mic pre/EQ and the 2264 compressor/limiter will do. By the time that you’ve paid for those and bought a rack to put them in, you’ll have spent considerably more than the cost of a 5051, 5052, PSU and the wooden two–bay rack. If you’re looking for an alternative mic pre/EQ/compressor combination the Manley VoxBox and the Retro Instruments Powerstrip would probably come into play, as would RND’s own Portico II Channel. All these would leave you with some change, although you’d have to do without the Shelford–series sound. Designed for the DAW environment. Not cheap, but that is outweighed by their performance. The Shelford Series 5051 and 5052 take inspiration from the early designs that Rupert Neve developed back in the days when his company was based in his home in Little Shelford, near Cambridge. Building on this legacy, RND engineers have developed two superb modules that bring the classic Neve sound right up to date and, taken together, form a complete and flexible modern vintage channel strip that is ideal for today’s DAW environment. Shelford 5051 inductor EQ & compressor £1918.80. Shelford 5052 mic preamp & inductor EQ £1918.80. Five–way PSU £779. Prices include VAT. Shelford 5051 inductor EQ & compressor $2249. Shelford 5052 mic preamp & inductor EQ $2249. PSU $749. Wooden rack $249. All units bundled, including case and PSU $5496.